Size = Inside length or inside diameter. 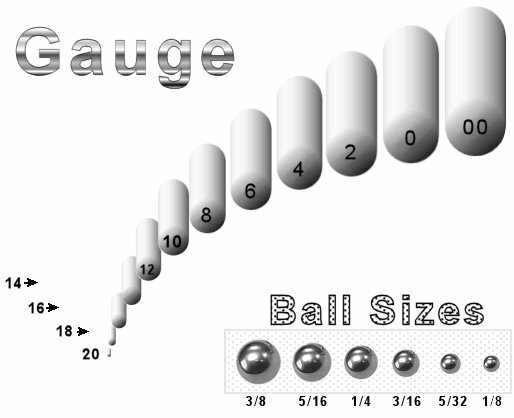 Gauge = The thickness of the metal. Please note that sizes may not display accurately on your monitor. Always use a household ruler to measure. If all else fails we will even measure your current jewelry for you for free. All that you have to do is mail us a piece of jewelry that fits you properly, along with your printed order of what you want, and we will measure your jewelry, place your order, and then send the piece back to you with your order. * You MUST soak your jewelry in Alcohol and wash it with soap and water prior to sending it to us. * We suggest that you send it in a manner that is tracked. If we do not get it, we can not return it. * We are not responsible for that item if there is a loss when we ship your order to you. * We will measure the piece with 100% accuracy, however sometimes a different piece will fit differently due to a different angle of curve in the bar, or different amount or location of weight, so we are also not responsible for pieces that are not the correct size. No different then if you went to a local piercer. Remember though this is not our goal, we do want you to be happy.